Show off your photographs, artwork or products in a custom-made square photo book. The handy size and glossy cover make it an ideal brochure, perfect for presenting anything from your own fashion line to family memories. Handbound using traditional methods, square book printing is an elegant alternative to ordinary albums. This versatile photo book has so many uses, it can be personalised to be a photo album for a loved one, or a glossy brochure for your business. A personalised square photo album can be used for anything, from showcasing holiday photos in a contemporary way to a glossy brochure to display products and business information. This is a very versatile product for visual people. I cannot praise Rio and his team at 'Bags of Love' highly enough! I was really struggling to upload pics and get my photo-book ready in time for my partner's birthday, and Rio went above and beyond the call of duty to talk me through the process and help with layout etc. In these days of automation where customers are so often left to fend for themselves, it was just fantastic to be able to get help from a jovial and kind team. In the end we managed to get the book ready and delivered on time which for me was a miracle - the recipient was chuffed with it and I learned a lot which will stand me in good stead next time, as this is such a great gift idea. Thank you so much, Rio and 'bags of love' to you and your team! Ordered the lookbook to use as my portfolio for my final MA Degree show and honestly it is just fantastic!! the print quality is amazing. A really high quality book and I would highly recommend! I found the service really suited what I wanted, a mixture of text and pictures. It was easy to use and I was able to get it delivered really quickly. The only thing I had trouble with was resizing rather than just moving the text boxes. I would definitely use you again, thanks! Who is the Square Photobook Perfect for? Artists, writers, designers and other creative professionals use the square photo book to present their work in a professional manner. Choose your own layout, format it however you want and include any photos, text or designs. Digitally printed using a specialist process, the print is sharp, clear and vibrant. Self-publishing has never been easier. Like many of our products, the square photo book comes with a quantity discount, so buy a bulk today and save money. Handbound in London, UK, using traditional bookbinding methods, this is truly bespoke and one-of-a-kind. Featuring glossy front and back covers and 40 internal sides to customise, it's a smart, conveniently sized square book to fill with your photos, designs, art or even written works. The spine comes in four colours; black, blue, green or red, so choose a colour that complements your cover designs. What's more, we print exceptionally fast, so can turn these around super quickly if you've got a professional deadline to adhere to. It is printed in folios, meaning one sheet of paper makes four pages. If you were to only fill in 35 pages, this means folios would be partially incomplete, leaving blank pages at the end of the book. These can be used as note pages, but otherwise plan to fill the pages in either 4, 8, 12, 16, 20, 24, 28, 32, 36, or 40. 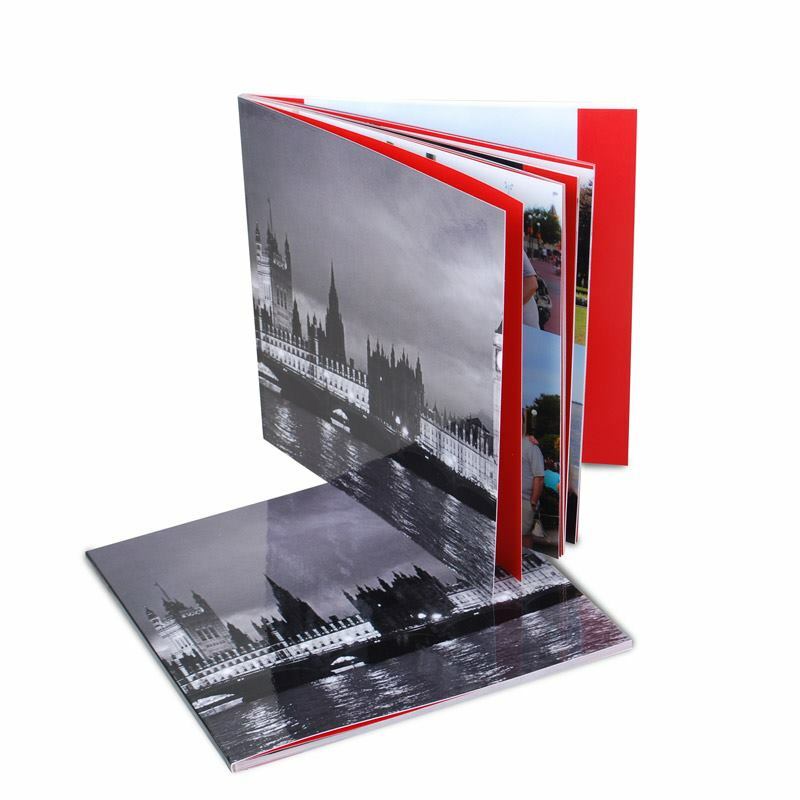 Every aspect of your photo book is personalised by you, so design the covers and all the pages inside. It's very much a blank canvas for you to unleash your creativity. If you're a designer and want to display your fashion or product line professionally, this is perfect as you can include photos, text, icons and patterns. The front cover can be stylishly simplistic, featuring your logo and signature, leaving much to the imagination as to what is inside. You can create a small square photo book to give as a gift to a loved one. Filled with memories, stories and old photographs, this is a sentimental keepsake that will last a lifetime. Create photo collages or even lay your pages out to resemble a scrapbook, to give it that homemade touch. The square photo book is the ideal shape and size for a catalogue, brochure or recipe book. As a completely unique gift, get together all the classic family recipes and create your own food book, ideal for passing down the generations and keeping dishes alive.